I tried a new hair salon today, I think by now I went to almost all the hair salons in San Francisco and I haven’t found a stylist that knows how to cut short hair. I like my hair very short and it seems that most women in the US wear long hair, therefore most hair salons don’t know how to cut short hair. They know how to color and cut long hair, but as far as short is concerned, they just have one hair cut that they do on everyone. So I tried a new salon down town, and I got assigned to a hair stylist. I don’t know if this was me or her, but she did not talk at all, so I tried to make some conversation, nothing really philosophical, but to somehow tuer le temps as we say (kill time), and nothing really seemed to interest her, so I just kept quiet, thinking maybe she was having a bad day…everyone is allowed to have one. Anyway, my hair is short and I still don’t like the cut, nothing different than usual, but on top of it, the hair stylist was not pleasant. I love bittery greens, and the bitter the better! Doing my regular grocery shopping I found those gorgeous purple red mustard leaves, they seemed so young and tender, that it would have been silly not to buy them. I always have some spring roll wraps, that I buy thinking I will use them, but never do, which is a shame. So I promised to myself that no matter what, I will prepare something with those wraps. Of course, you can just imagine what happened to the wraps and red mustard leaves…they got married and that was a match from heaven. The other highlight of this dish is really the beet vinaigrette. The sweetness of the beets was incredibly delicious combined with the bitterness of the greens and melting kasseri cheese. Kasseri cheese is Greek and is made out of sheep milk with a touch of goat milk. Its consistency is similar to mozzarella, and tends to melt easily. You can mix the cheese with the greens, I added the cheese at the end, that’s the reason why it’s barely noticeable on the picture, but you can mix it with the greens. This is a fairly quick dish to prepare and is delicious as a main dish with a salad or as an appetizer. Wash mustard leaves thoroughly. 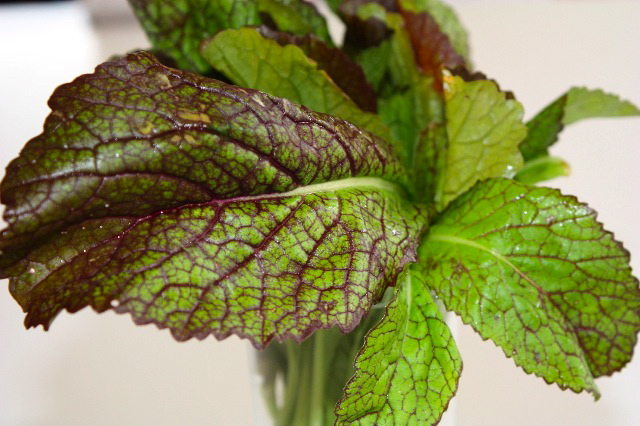 Bring a large of salted pot of water to a boil, and cook mustard leaves for about 5 minutes or until tender. Drain, let cool and squeeze extra water using your hands. Chop finely. Heat olive oil in a pan, add garlic, stir for a few minutes, then add chopped mustard leaves. Adjust with salt and pepper (don’t add to much salt since the cheese and olives are already salted). Add lemon zest and stir for another minute or so. Remove from stove and set aside. Add olives. At this point, you can add cheese to the mixture or add it at then end, like I did. 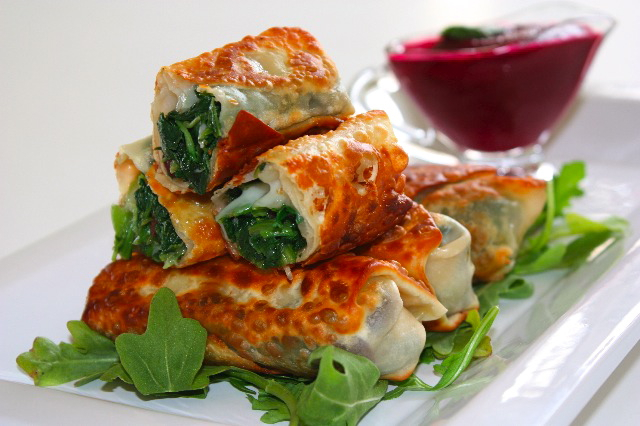 Place on wrap on a flat surface and add greens and cheese. Roll like a cigar (not that I have ever rolled a cigar). Proceed the same way with all the rolls. Heat olive oil in a pan, and add each rolls, watch them carefully, they burn easily, turn them around to brown all sides. Remove from the pan and drain extra oil in a paper towel. Serve with arugula leaves and beet vinaigrette on the side. Cook beets until tender in water. Peel and let cool. Blend in a mixer with the rest of the ingredients. This entry was posted by silvia on May 20, 2010 at 2:53 am, and is filed under Appetizers, Vegetarian - dairy. Follow any responses to this post through RSS 2.0.You can leave a response or trackback from your own site. Oh this I must try…Very beautiful, and sounds simply divine! What a gorgeous vinaigrette! Actually, all of the flavors and textures – from the kalamata olives to the kasseri cheese to the spring roll wrappers – are inspired. I love your new header! Sorry, not a good hair experience. I have thin hair and a widow’s peak, so my hair is not easy to cut too. I finally gave up and now spend $50 a haircut. Too much for my pocket book, but she’s the first stylist I like. Back to your food – which looks fantastic!! I’ve never seen kasseri cheese in my local market. I’ll have to look for it! I like this combination of ingredients and the idea of a beet vinaigrette, very interesting and beautifully put together, I like your blog! Sorry about your hair, I get mine cut in Petaluma, a bit too far for you! Ma pauvre Silvia!! A woman’s hair is her crown and I am so happy that I found my perfect stylist! I too love my hair very short and completely understand how you feel. La, je dois dire que tu m’épates! C’est non seulement terriblement élégant mais j’imagine le goût est aussi magnifique et l’idée d’allier cette vinaigrette de betterave c’est vraiment inspiré; aucun chef de France et de Navarre ne peut faire mieux, foi de zjoumana!!! PS Je suis étonnée que tu ne trouves pas de bon coiffeur a S.F. Essaye les étrangers, iraniens, ou autres. What a gorgeous post and a gorgeous meal. I have seen you around the blogoshere but I am sure glad I popped in to say hello or I would have missed out on your culinary delights. I would never have thought to wrap a leafy veggie in a spring roll wrapper. This is brilliant! Je n’ai jamais essayer une vinaigrette a base de betteraves, ca doit etre interessant a essayer! What a beautiful dish! I have never had kasseri cheese before but there are very few cheeses that I don’t like. I also love everything with beets, and I think it was an inspired idea for you to pair the vinaigrette with the rolls. I love the look of this dish, the combo of colors textures and flavors! I bought some collards yesterday and steamed them with fish for lunch..I’m going ot have to try this as the greens are looking so good right now. I am also a short hair person and have been so lucky finding someone good here in Sonoma, I go to Paulas’ person..she turned me on to him, he doesn;t advertise and one has to be recommended but his prices are great , somuch less than what I was spending in Los Angeles and he knows what he’s doing. My hair is curly and short and finding someone who cuts curley hair well is difficult. The rolls looks similar to Asian spring rolls but I have to say this the color of the rolls and the vinaigrette are better! yum.. This is brilliant. I like this. I thought thought to use those combinations. And clever to use spring roll wrappers. I might try that…. You’re so creative, I love it. I think bitter greens are amazing too. Such a pungent kick that I enjoy so much. I love the combination of flavors here and it looks so pretty. As far as finding a hair stylist goes I have the same luck as you but I have long hair. I have noticed that Vidal Sassoon has the most highly trained people. And a lot of them train in London, where short hair is really popular. Maybe there is one in SF? Silvia, I really admire your creativity in the cooking…this looks sensational! Love Kasseri cheese. Your beet viniagrette sounds wonderful. Gorgeous dish. A+++ presentation. The article should be up later today, I will let you know. Sorry about your hair salon experience. Hopefully you’ll find the right stylist soon! This dish looks amazing. I LOVE how thick and rich the vinaigrette looks. It sounds healthy and delicious! Thanks for your thoughts on ASP. You are right, imperfect people make the world go around. It’s best to accept, and be thankful for who you are! The beet vinaigrette looks wonderful and so are those rolls! I’m sorry about your hair cut. Sometimes, I hated it too when the hairstylist doesn’t make any conversation with me. Felt like an idiot sitting there (talking to the mirror or something)! Sorry, I definitely won’t be going back there again! Hope you’ll have a wonderful day! So gorgeous and so creative! And this is too funny, all this time I thought you were blogging from France, not NoCal. Love your posts! What a stunning presentation with this dish, so colorful. And love the beet sauce and the major color it adds. Ah pauvre toi pour la coupe. Déjà allé au salon devrait être une escapade et une traite masi une coiffeuse ‘plate’ avec une coup non satisfesante. Au moins les cheveux repoussent. That looks so nice and tasty. I love how crispy you were able to get them. Thanks for sharing! Anyway, your rolls and vinaigrette look superb! These rolls look absolutely amazing. What a wonderful way to start my day. I am also a fan of bitter greens and love your use of mustard greens in this recipe. The sauce sounds like a terrific compliment to these rolls. Great photography. I love the colors. It’s a shame when you can’t get the haircut that you want, but in the meantime you can continue to share delicious dishes like this one. When I lived in Vail, I had a lady cut my hair short and it was the best haircut I have ever had. People used to stop me and ask me about it, believe it or not! That was until she moved, then I moved and needless to say, I have grown my hair long now after so many attempts that ended in horrid cuts.. i feel your pain. Hey Silvia, these are really beautiful. I need to go get some spring roll wrappers. The beet vinaigrette looks so beautiful, I’m inspired to make it this weekend! Hello! 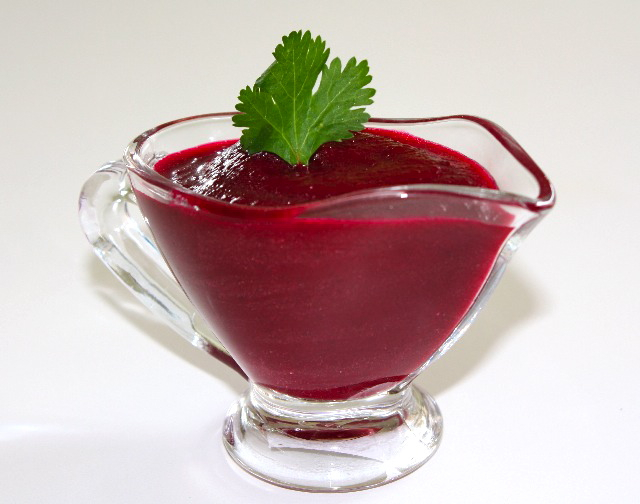 It is a great recipe and I am so glad to see that you love beets, like me (yesterday, I wrote something about beets, too)! Red beet dressing will goes delicious, I am sure ! Thanks for sharing – your appetizer looks fantastic, really! The kind of layering over here (the rolls, not the hair) is well-profiled. Look at the crisp on the rolls, and moist fillings…perfect. Ah les coiffeurs, ici c est l horreur! Au pays des chaines, c est malheureux de ne pas trouver un Jean Louis David. Meme si je ne suis pas une grande fan des bettraves, je vais essayer ta recette. Sorry about the bad hair experience. I know how traumatic that can be. I love my hair stylist, who is a good friend of mine. But she’s in Berkeley, so I’m not sure you want to go across the bridge for your hair needs. those rolls look incredible….I know my girls would just love them….It has been oh so many years since I have made my own spring rolls, I really need to start making them again….store bought rolls are not very good…. These are right up my alley – delicious, quick and healthy. 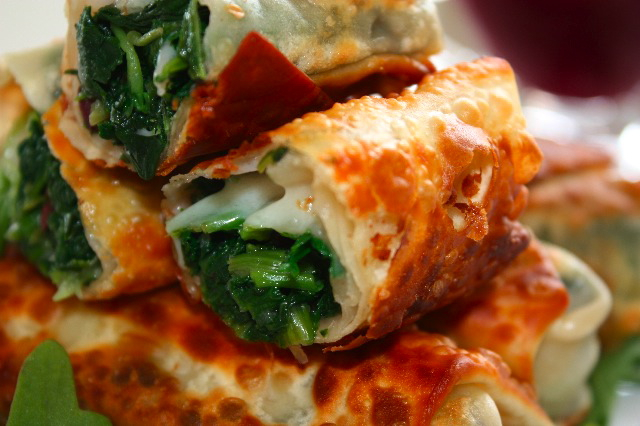 I love spicy greens with cheese and I can’t wait to try this combination. I absolutely love the ingredients and presentation of these rolls! I’m on the lookout for kasseri cheese. I’m thinking I’m not going to find it at my local markets. May have to find a specialty store. It’s so hard to find a stylist that you build a long repore with. I’ve been going long these days, but I can attest that a long hair-style can be messed up too (funky cut layers and overtexturized ends can really muck up your hair for months!). I feel for you and your salon experience…it can be an unpleasant ordeal. I hope you won’t patron the same stylist since she didn’t feel it was important to make you feel comfortable and provide a pleasant experience. These look gorgeous and delicious. I love everything about this dish. This definitely gets bookmarked!